Americans own a lot of stuff. We buy things we don't need and then complain about the debt. According to NPR.org, the average American house size has more than doubled since the 1950s and it continues to grow. Why might you ask? It probably has to do with all the stuff we're accumulating in this country. Seriously, do we need it all? This is such an issue dear to my heart because my natural tendency is to buy stuff without any regard for the financial consequences. I've spent A LOT of money on junk in my day which I talk all about in my book The Recovering Spender. So how does one stop buying more junk? How does one go about actually doing this? To avoid buying things we don't need, you've got to dig deeper. You've got to understand the root of it – because it's all emotional and psychological! 1. You want to impress people. If you drive an aging vehicle, do you think anyone is going to care? And even if they did care, why do you care what they think? Instead of learning how to save money on auto repair, you just go out and buy a new car. Our need to impress others comes down to our sense of pride. This isn't the good kind of pride, either. Not only that, but being prideful can encourage you to live up to a certain standard that will eat away at your savings account. 2. You're in the habit. Some people shop because they like to look around. If you're one of those, realize that you probably have a shopping habit you need to break. Think about it. If you can't think of anything you need right now, why put a whole bunch of stuff in front of your eyes that you'll want to purchase? Break the just-for-fun shopping habit by making a list of things you need as you think of them during your day and only purchasing what's on the list. 3. You don't think through what you already have before you purchase. 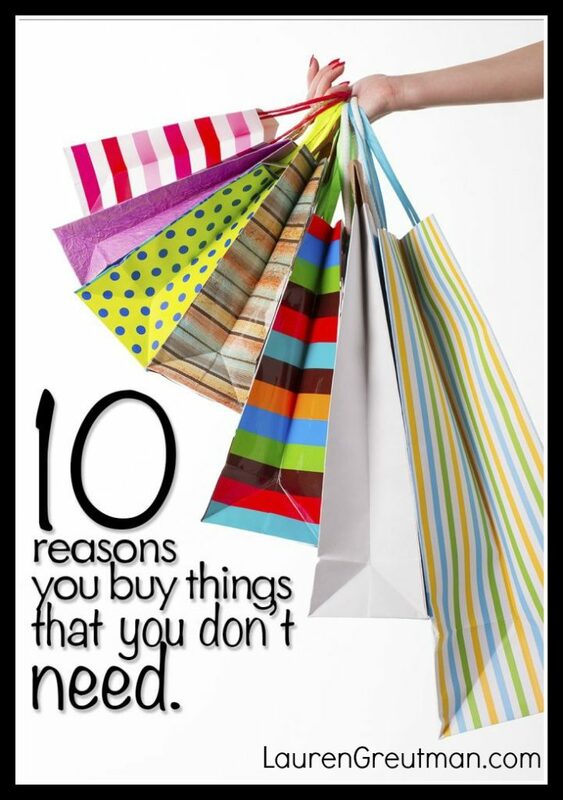 Thinking about what you already have and finding contentment in those things can help you curb unnecessary purchases. What are you thankful for? What do you have that already gets the job done? When you think along these lines, you'll stop focusing on what you do have instead of what you don't have – which leads to a great deal of contentment and joy. 4. You're depressed and you get a high from purchasing stuff. One of the worst times to go shopping is when you're depressed. There is such a thing as financially driven depression. Do you buy food you really don't need? How about clothing? These are just a few of the purchases I've seen depressed people make when they really didn't need anything more than what they already had. 5. You're a tidbit selfish. Let's admit it. Our natural state as human beings is to be selfish. Our culture teaches us to improve our lives. Why? Because that message sells. 6. You are exposed to too much advertising. The effects of advertising are powerful. Imagine the piles and piles of money spent on advertising every year. It's astronomical. Why do companies spend so much money on advertising? They would only do so if it worked. Think about this. Do you remember a time when you looked up a funny commercial online because it was just so hilarious? When you start wanting to watch advertisements, companies have done their job. Skip the commercials if you can. Pay a little extra to listen to internet radio without the ads. Buy and download episodes of your favorite TV shows instead of subscribing to cable. You get the idea. 7. You feel that more stuff will give you a greater degree of security. For some reason, many people equate more stuff with more security. But just because you have more stuff doesn't necessarily mean you can't lose it to a fire or a freak accident. Why does more stuff, above what we need, give us a greater sense of security? I'm not sure. Can you think of one logical reason? 8. You want to keep up with your friends and family. Don't try to keep up with the Jones. Remember: What your friends and family needs isn't necessarily what you need. Everything else is discretionary. 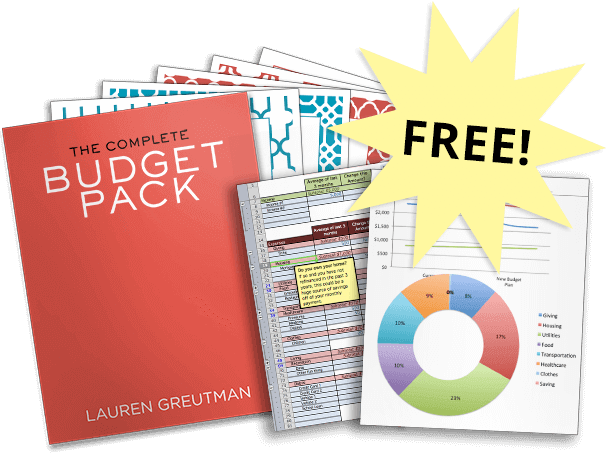 Start a budget and clearly define what's necessary and what's discretionary. 9. You neglect creative solutions to your problems. Instead of buying a new appliance, why not see if you can fix it up for less? Instead of buying a new duster, why not use an old rag? Instead of going out to eat, why not use up some of those leftovers in the fridge? You get the idea. Find creative solutions to your problems and you're sure to save a bundle of cash. 10. You think more stuff is an investment in your future. For example, a car salesperson might try to encourage you to make an “investment” in “reliable” transportation when your used car is working just fine. Make sure to be careful when you hear a salesperson use the word “investment” when describing their product or service. Don't buy unless the purchase makes sense for your needs! The end result in buying things that we don't need it that we spend all day decluttering and organizing these items, when instead we could be doing things like hanging out with our kids or doing something we love. What are some things you buy that you don't really need? Leave a comment! One reason I spend on clothes, makeup and so on is that I want to look good. I’m an overweight 48-year-old woman with rosacea and a couple of chins. Buying clothes gets me compliments and makes me feel more confident. But I need to regulate myself. My problem with shopping is definitely rooted in my depression. I may be wrong, but when I do buy things that I don’t need they tend to be things that I want and would give me a small sense of happiness. The problem is, I buy too many of what I want during times when I’m super down and I sometimes even forget that I bought things until I get a message saying that things are shipped and on their way. At least I’m still good with my finances (so far) and I haven’t fully regretted the things that I’ve bought. I often forget about them but when I do find them again/remember them, they still make me smile for a moment. I just worry that I might seek happiness in material things. I used to collect things all the time that I did not need. My room and shelves were literally stuffed with knickknacks and clothes that I never wore. Recently though, (like within the past 2 years) I have been driven to get rid of anything that I don’t use or love and I’m shocked to see just how little I have left. The amazing thing about it is that I don’t miss a single thing that I purged! I way more than halved my possessions and it is astonishing to see how many things I could get rid of that I used to think were great sentimental treasures. Realizing how much I don’t even miss the things that I once believed were so important has made me stop and evaluate what should be brought into my life and what I should be spending my money on. Living in the American culture that I live in, I know it is impossible not to WANT more than I need. But whenever I feel that urge to buy something, I always step back and wait. If I still want it just as strongly a few weeks from the time I first discovered it, then I can make my decision to spend money on it or not. We all know that we are going to die eventually, so it is really pointless to hoard up stuff that we will never use! We can’t take our junk with us after all. I love (hate) how this website attracts people who are obviously struggling with materialistic tendencies and then blasts a quarter of the page with advertising… way to go. I was on tip edge of buying a “budget” handheld game console because it looks cute. I already own the more advanced version of it not too long ago. I could already tell that this giddy feeling will wash away after the days go by in owning this thing. Thank you. This article hammered down the nail.